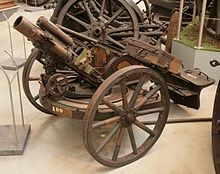 Minenwerfer ("mine launcher") is the German name for a class of short range mortars used extensively during the First World War by the Imperial German Army. The weapons were intended to be used by engineers to clear obstacles including bunkers and barbed wire, that longer range artillery would not be able to target accurately. The Germans studied the Siege of Port Arthur, where heavy artillery had been unable to destroy defensive structures like barbed wire and bunkers. The German Military Ingenieurkomitee ("Engineer committee") began working with Rheinmetall to study the problem in 1907. The solution they developed was a short-barrelled rifled muzzle-loading mortar, built in three sizes. In 1910, the largest of these was introduced as the 25 cm schwerer Minenwerfer (abbreviated "sMW"; English: "25 cm heavy mine launcher"). Despite weighing only 955 kg (2,193 pounds), it had the same effect on targets as the 28 cm and 30.5 cm mortars, which weighed ten times as much. At the outbreak of the First World War, 44 had been delivered. They were used successfully in Belgium at Liege and Namur, and against the French fortress of Maubeuge. The medium version, the 17 cm mittlerer Minenwerfer (mMW; "17cm mid-sized mine launcher"), was introduced in 1913. At the outbreak of the war one year later, 116 were fielded. The light version of the weapon, the 7.58 cm leichter Minenwerfer (LMW; "light mine launcher"), was still at the prototype stage when the war started, but rapidly entered production. The weapon was far more efficient than its artillery counterpart: in comparison, the 7.7 cm FK 96 n/A needed to be towed by a team of six horses, compared with a single horse for the LMW; additionally, the LMW could be moved around the battlefield by four men. The minenwerfer was cheaper, costing only one seventh as much as the artillery gun, as was its ammunition. Since the muzzle velocity, and thus firing shock, of minenwerfers was low, a variety of explosives that would usually be unsuitable for use in artillery was used to fill the shells. In any case, TNT explosive was reserved for use in artillery shells. Typically, the explosives used in minenwerfer shells were ammonium nitrate-carbon explosives. However, the sensitivity of the explosives occasionally made them detonate in the tube. There were a large number of these incidents, one of which claimed the life of Karl Völler, head designer of Rheinmetall, in 1916. These problems, however, were eventually overcome. Recognizing the numerous advantages of the minenwerfer in trench warfare, production was stepped up and, by 1918, the numbers had increased dramatically to 1,234 heavy, 2,361 medium and 12,329 light minenwerfer. A 38 cm calibre sehr schwerer Minenwerfer (ssMW; English: "very heavy mine launcher") was also developed. This page was last edited on 30 July 2018, at 13:06 (UTC).